New York single Stripe sock with star pin looking mighty fine with a multi tone wooden shoe. Available in Accessories in the store. 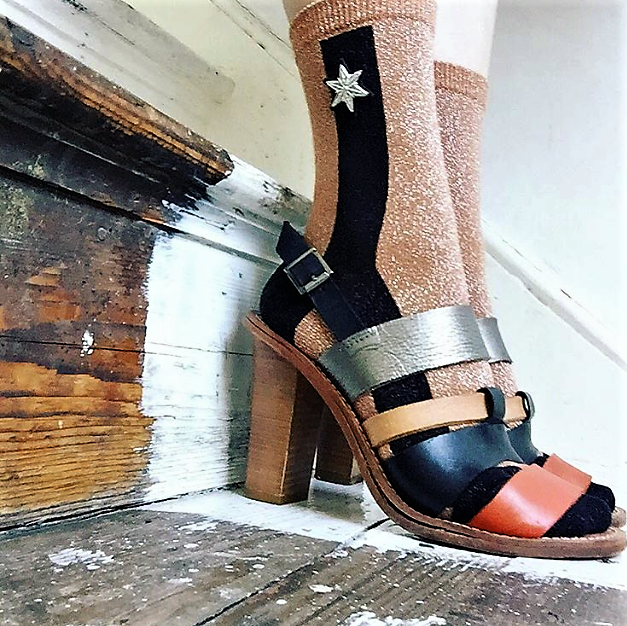 Super socks have arrived at the store, this wonderful footwear for your fashionable feet are perfect for the colder months and will look great with heels + trainers + sandals. Each pair has its own special brooch, you can customise your socks or wear on your clothes. The designs are conceived in a studio on the Stockwell side of Brixton (Sixton). Inspiration can come from the local area; lightning bolts inspired by Brixton local, David Bowie. Insects and butterflies inspired by a trip to the Horniman museum. Or further afield as they travel the world.